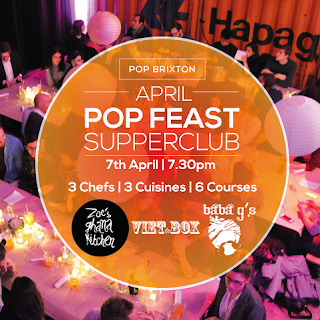 Pop Feast is a regular supper club run in the big Pop Box space at Pop Brixton, with courses from a varied mix of their brilliant food traders. The next takes place on Thursday 7th April with 6 courses from Zoe's Ghana Kitchen, Baba G's and Viet Box. Tickets are just £40 and there will also be an extensive bar, so it's going to be a great night! 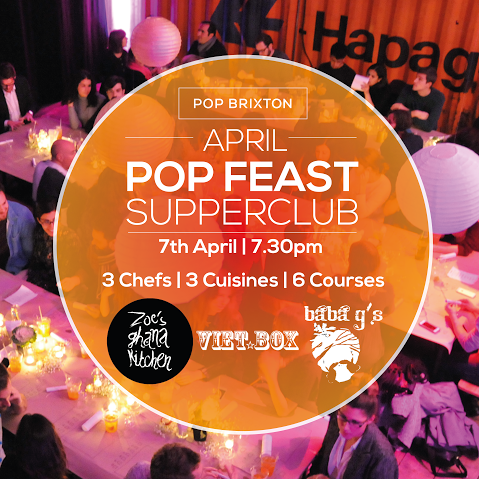 "Pop Feast is a special event we host every other month, where we bring together 3 of our amazing food traders to create a one-off, globe-trotting, 6 course tasting menu. - Avocado and cacao mousse with agave syrup"